The Big Wobble: Bosnia reported its first case of bird flu on Sunday becoming the 37th country in the world to be struck by avian-flu since end of October! Bosnia reported its first case of bird flu on Sunday becoming the 37th country in the world to be struck by avian-flu since end of October! Bosnia reported its first case of bird flu on Sunday, after the H5N8 strain was detected at a hen farm in the northwestern town of Prijedor. 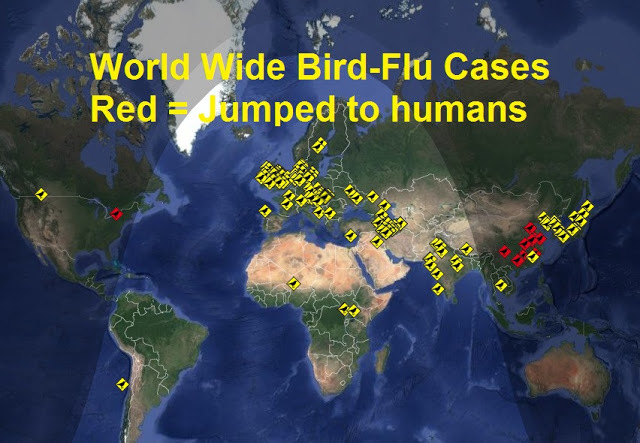 It is the 37th country in the world to be struck by avian-flu since end of October! The authorities took measures to contain the outbreak of the disease and banned visits to the farm, the state-owned Srna news agency reported citing the agriculture ministry of Bosnia's autonomous Serb Republic, where the farm is located. Nobody from the ministry was immediately available to confirm the news. Cases of bird flu have been found in many countries across across the world in the past months, including in neighbouring Croatia, Serbia, Macedonia and Montenegro. The ministry said it would inform the public about its further steps, Srna reported.